According to national statistics, nearly two thirds of adults across the UK have not written a will, leaving their final wishes in the hands of Government intestacy rules. This is quite alarming. Writing or amending your will shouldn’t seem like a daunting process or something to put off for a rainy day. The simple process will ensure that your future wishes are confirmed and your loved ones are protected should life take an unexpected turn. This November, St David’s Hospice is offering you the opportunity to protect your loved ones and ensure that their future is secure by taking part in the Hospice Will Month campaign 2018. If you are aged 55 or above, you could be eligible to take part in the Hospice Will Month scheme which takes place throughout November 2018 in partnership with David Jones Solicitors. (If you are making your will as a couple, only one of you needs to be over 55). 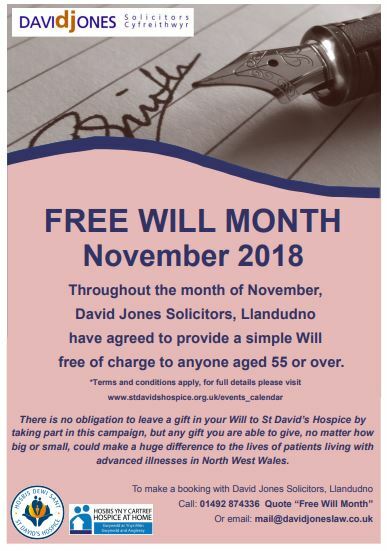 To have your FREE basic will written during November, please call David Jones Solicitors, Llandudno on 01492 874336 and quote “Free Will Month” or email: mail@davidjoneslaw.co.uk. Appointments are limited, so we recommend you book your appointment as soon as you can. The Free Will Month covers the writing of a ‘simple’ Will only. If your Will is complex or if additional work is required a fee will be payable by you. 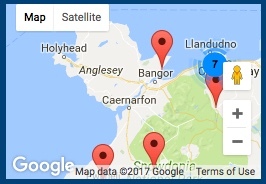 Whilst you are not obliged to give a donation or leave a gift in your will to St David’s Hospice by taking part in this scheme, anything you might consider, no matter how big or small will make a lasting contribution to our work. The Wills prepared by David Jones Solicitors through the Free Will Scheme have already provided invaluable peace of mind to supporters of St David’s Hospice, and have also helped secure legacy gifts for the Hospice which will play a truly vital role in ensuring that the Hospice can continue to deliver free, high-quality, specialist palliative care to patients with advanced illnesses, their family and carers, long into the future.